I saw this Cash Register package at Fry's the other day. Great idea combining software with specialized hardware and putting it into retail, but while I haven't had any hands-on experience with it, I can almost guarantee that it's not a well integrated offering (Intuit makes some pretty good software, but integration between the products is almost non-existent). 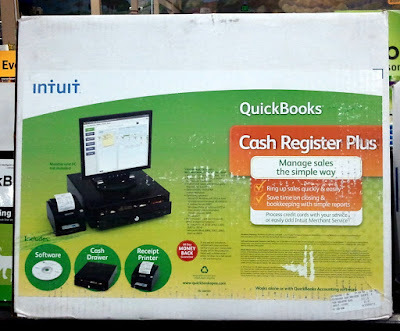 If you read closely on the box it references a download into Quickbooks format, which probably means that the user has to download transactions from the terminal (which has to be powered by a pretty beefed up PC) and import it into Quickbooks. This kind of manipulations leads to disconnected processes with a lot of manual steps and no real-time visibility or centralization. This however creates a great opportunity for SaaS accounting solutions to provide a well integrated experience where all the transactions are immediately synced to the online database, the management can see and react to real-time data, all the refund/corrections are immediately processed and don't have to be re-synced, and any and all communication can be triggered off the transaction data right at the time the transaction went through. One thing that has to happen however is software providers have to get their hands dirty with hardware. Yes, I know, you guys hate that, it's capital intensive and creates logistical headaches, but I'm afraid that is what it takes to get a product into mass market, and mass market is what you want, is it not? SaaS accounting companies - don't snooze - this is your chance to really break into this market, use it! I received this letter from Amazon Web Services today about launch of its Simple Email Services. This is a big deal as bulk email has always been more of an art than a science and no good Platform-as-a-Service solution existed to my knowledge, so web application developers had to resort to writing their own email distribution systems that were prone to black-listing and couldn't scale well or use very expensive solutions from a few software providers. This functionality available from AWS means that more SaaS applications will implement email marketing as part of their offering and those that already do will make it better and more affordable to use. We're excited to announce the beta release of Amazon Simple Email Service (Amazon SES), a highly scalable and cost-effective bulk and transactional email-sending service for businesses and developers. Amazon SES eliminates the complexity and expense of building an in-house email solution or licensing, installing, and operating a third-party email service. The service integrates with other AWS services, making it easy to send emails from applications being hosted on services such as Amazon EC2. With Amazon SES there is no long-term commitment, minimum spend or negotiation required - businesses can utilize a free usage tier, and after that, enjoy low fees for the number of emails sent plus data transfer. Building large-scale email solutions to send marketing and transactional messages is often a complex and costly challenge for businesses. 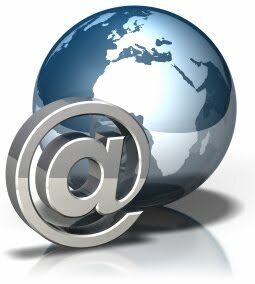 To increase the percentage of emails that are successfully delivered, businesses must deal with hassles such as email server management, network configuration, and meeting rigorous Internet Service Provider (ISP) standards for email content. Additionally, many third-party email solutions require contract and price negotiations, as well as significant up-front costs. Amazon SES eliminates these challenges and enables businesses to benefit from the years of experience and sophisticated email infrastructure Amazon.com has built to serve its own large-scale customer base. Through a simple API call, developers can now access a high-quality, scalable email infrastructure to efficiently and inexpensively communicate to their customers. You can be confident that Amazon SES will scale with your needs. A built-in feedback API provides the metrics you need in order to monitor the quality of your email, and to maintain good relationships with your customers. As an Amazon SES customer, you don't need to build your own email solution from the ground up, or incur the costs of licensing, installing and operating third-party software. Instead, you can start sending messages in minutes using the AWS software development kits for Java and .NET, or code directly to our HTTPS interface using your favorite programming language. Amazon is able to pass on the efficiencies of its scale to customers, and pricing for Amazon SES is only $0.10 per thousand email messages sent. Additionally, a customer can send 2,000 email messages for free each day when these emails originate from Amazon EC2 or AWS Elastic Beanstalk. A tell sign of any successful product is how much attention is given to details. You can hit everything right on feature checklist and have the most amazing interface, and integrate your products into a clever eco-system, but at the end of the day if I'm going to use your product for actually doing something, I will want little things to work.. I've been raving about Zoho for a while - they've done an outstanding job of putting together a lot of slick functionality and doing a pretty good job integrating the pieces, however having used their (paid) CRM product for a while I do have a bone to pick.. When I create an invoice I expect the description information that I entered in products to show up in the description information of the product once it's been added to the quote. When I print create a pdf of the invoice to be emailed I expect the description information that I've re-typed to show up on the invoice. And finally when I go to edit an invoice template so the darn description information is there, I expect the edit to work. And to make sure that I'm picking on one little detail (not so little when you think about it), this is not the first time I've run into a glitch like that. Zoho, you have a good thing going.. Please don't screw it up! Looks like the issue with template editing has been solved. I was able to pass the product description on to the quote template! Just on the heals of my accounting solutions review, Zoho comes out with an announcement about Zoho Books, making its own claim to the small business accounting space. I must say - it makes sense.. And Zoho has a lot going for it! It will integrate with the CRM, Reports, Scheduling, existing user hierarchy.. Sure, it's not as feature-rich or automated as some of the other products, but Zoho has got no lack of development zeal to fill in the gaps real quick. The only thing stopping Zoho now in my mind is the fact that they are not a public company.. I don't know how many businesses will entrust their finances to an unregulated entity.. On the other hand that is the case with the rest of up-n-comers. How about that IPO, Zoho? Those who've used Mint.com and have a business are probably wishing they had an accounting system as frictionless as that! I certainly am and for a while I've kept an eye on web-based billing and accounting applications out there, of which I must say there's no shortage. My criteria has been to find something that would replace Quickbooks entirely while providing a Mint.com kind of experience, that would offer effective cash flow management, and would be integrated with CRM systems and credit card terminals. Problem with accounting software has always been that it required dedicated time to collect and enter the data and the more data has to be entered, the more daunting the task becomes, so most business owners would just relegate the job to the bookkeeper / accountant and thus would rarely use it as a business intelligence and forecasting tool that it could be. I think this is about to change however. I think we're nearing a point where business owners are actually going to start living inside of their finance systems much the same way they currently live inside email/calendar. Why you ask? Due to a new generation of online accounting solutions that do more, make it much more than simple double entry accounting. The new systems have integrated invoicing, automated collection, multi-user access, reporting, and most importantly - bank account sync! 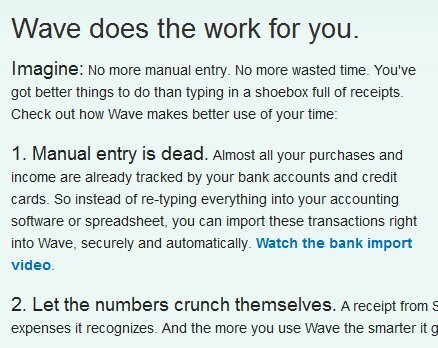 This last point is what I think is what could tip the scales for these solutions, and is a reason why I want to highlight Wave accounting. And yes, other system too can import financial report from your bank, but there’s a big difference between having to log on to the bank account, go the right section, dump a report, import it into the system, repeating it for each account. In any case, I think the train is about to leave the station and Intuit has some serious competition to worry about. I’m really excited about watching this space. Add to this list Outright - it has auto-sync with credit card and bank accounts like wave, and also has tax estimation. This is not a ledger product however, so don't expect to do serious accounting with it. It will produce a schedule C. No access to other parties. Best suited for single proprietors from what I can gather. Maybe this is the day that my barber will start accepting credit cards!? Probably not.. but Intuit's GoPayment system that added a free plan option today, and along with half a dozen other players in the space is workign on making it easier for small businesses to collect payments on the go or to forgo more expensive and binding credit card machine options. "Free" means that there's a plan without a monthly payment (which otherwise costs $12.95/mo). GoPayment also offers a free card reader (valued $60-120) so not a bad deal at all! What is does NOT offer (and this is my beef with other Intuit's offerings) is integration with Quickbooks online! To which I say "reallY? You guys have got to get your internal groups to work with one another!" 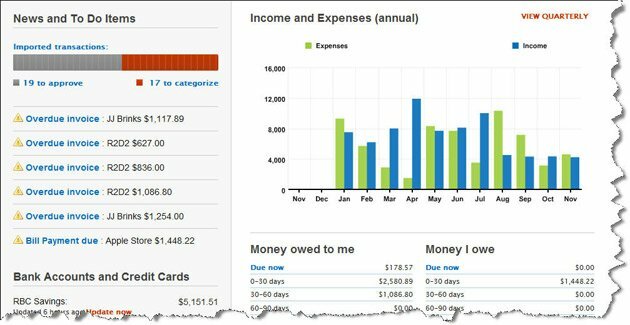 This creates a perfect opportunity for online accounting startups to offer a similar package that actually avoids the grunt work of double entry! ReadWriteWeb had a nice review of the few mobile credit card solutions today. If you are a SaaS provider and are looking to get a message out or for an advise, feel free to reach out.. If you're an expert on a subject and have something to say, I welcome guest posts.. If you're a potential user and are looking for advice on technology selection, feel free to reach out.. If you're a current user of a tool that has been covered (or hasn't been covered) and you'd like to attest to how well or how poorly it has performed for you, please reach out..
How comfortable do you feel about trusting your data to a SaaS application? What Office 2.0 functionality are you interested in? IS THAT MY PHONE? RingCentral, VirtualPBX, and Onebox go head-to- head to be all a small business needs for a competent phone system.